When 'soft' X-rays, beyond the range of ultraviolet light, strike an object, they are strongly absorbed by some kinds of atoms and not others. In particular, water is transparent to these X-rays, but carbon absorbs them, making them useful for imaging organic and biological materials. 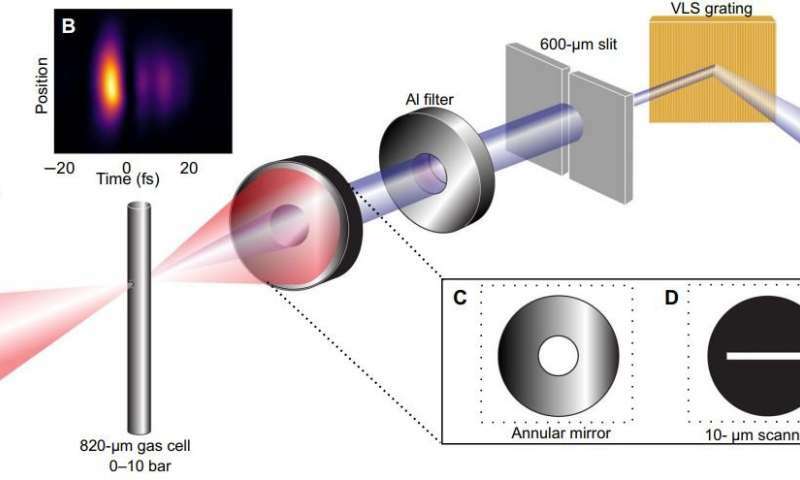 Fast soft X-rays have been created with large facilities, such as multi-billion dollar costing free-electron lasers, but now a research team from Imperial College London have generated fast and powerful fast soft X-ray pulses using standard laboratory lasers. The method, which can produce bright soft X-ray pulses that last hundreds of attoseconds (quintillionths of a second), is published today in Science Advances. Senior author Professor Jon Marangos, from the Department of Physics at Imperial, said: "The strength of this technique is that it can be used by many physics labs around the world with lasers they already have installed. "This discovery will allow us to make measurements at extreme timescales for the first time. We are at the frontiers of what we can measure, seeing faster-than-ever processes important for science and technology." Generating X-rays in a lab requires exciting atoms until they release photons—particles of light. Normally, atoms in a long, dispersed cloud are excited in sequence so that they emit photons in 'phase', meaning they add up and create a stronger X-ray pulse. This is known as phase matching. Lead researcher Allan Johnson, from the Department of Physics at Imperial, said: "We've managed to look inside what was before the relatively black-box of soft X-ray generation, and use that information to build an X-ray laser on a table that can compete with football-field spanning facilities. Knowledge is quite literally power in this game." The team at Imperial plan to use the technique to study organic polymer materials, in particular those that harvest the Sun's rays to produce energy or to split water. These materials are under intense study as they can provide cheaper renewable energy. 100's of attoseconds, this is pretty amazing! i think the slowed light through the bottle movie would take 20 minutes or longer to watch at 100s of attoseconds.